BoatUS is a “great proponent” of getting boats out of the water and on the hard before a hurricane, but with Sandy “this didn’t work,” says Beth Leonard, BoatUS director of technical services and editor of its Seaworthy magazine. The October storm, the fifth-costliest catastrophe in U.S. insurance history, was “unprecedented” and possibly a 100-year storm the likes of which we may never see again, she says. Yet given changing weather patterns, she says, the Northeast needs to prepare for more, if smaller, storms like Sandy. “It looks like they’re going to have to deal with things like this with more frequency,” she says. Although Sandy came ashore near Atlantic City, N.J., as a Category 1 hurricane, it combined with two other weather systems, creating a so-called “superstorm” of epic size and duration. 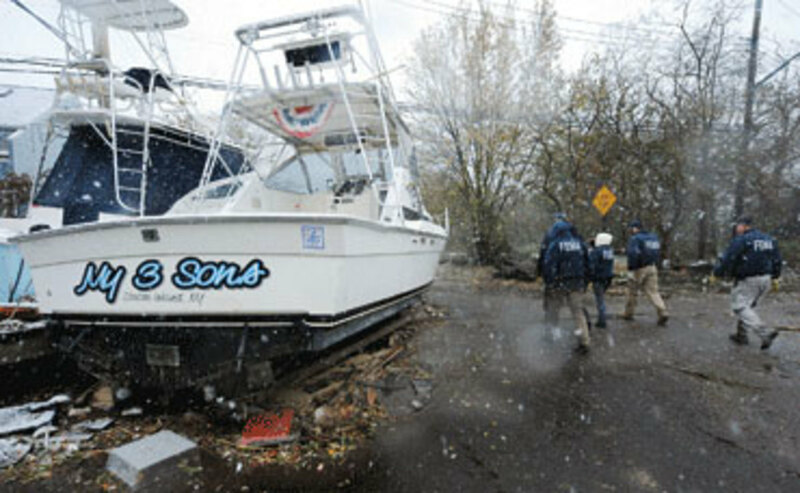 Sandy was the largest recorded Atlantic storm, spanning 940 miles with gale-force winds or better and producing 36 to 48 hours of brutal winds that piled up a 10- to 12-foot surge that rode in on several high tides and caused most of the marina and boat damage along the coast. Sandy’s surge rolled over hundreds of marinas across 400 miles of coastline, indiscriminately piling into heaps boats that had been secured on jackstands, sinking boats tied to fixed docks and lifting floating docks off their pilings, sometimes depositing the docks and the boats secured to them miles away. Floating docks survived — or didn’t — based on how tall their pilings were. Fifteen-foot pilings were barely tall enough to keep floating docks and boats tied to them from floating off the pilings at a Staten Island, N.Y., marina. ”One solution is to have tall enough pilings,” Leonard says. “That’s a lesson Florida has learned.” Even so, wind and surge tugging mercilessly at boats during the height of the surge can exert such leverage on a piling that it breaks or pulls out. She suggests that some of the strategies tried in Florida could work elsewhere — for instance, securing boats on jackstands and tying them together or tying them down with container straps to eye bolts sunk into the ground or in concrete. • Wind risk — Is the marina exposed? • Wave risk — What is the fetch? Marinas and boat owners both need a hurricane plan. He says floating docks have proved better than fixed docks, assuming the pilings are strong and tall enough. Marinas shouldn’t overload docks with boats and should properly maintain docks, design them to resist storms and adopt written policies and procedures — and practice them at least annually. Marinas also should adopt a policy for moving absentee owners’ boats and have a post-hurricane plan for communicating with owners, employees and local officials so marina staff are permitted access to the facility right after a storm. Leonard announced a webinar series, sponsored by BoatUS and the Association of Marina Industries, at 2 p.m. (EST) on March 5, 12 and 26 on, respectively, “Sandy Overview and What We’ve Learned,” “Securing Boats on Land” and “Securing Boats on the Water.” Registration is available at http://marinaassociation.org/training/online-webinars. Some 65,000 boats were damaged or destroyed in Hurricane Sandy. Boat damage alone was $650 million. Leonard says a sense of complacency had set in among many Northeast marina owners and boaters before Sandy. “That complacency has gone away,” she says.